The village of Bonnieux is pretty, and its location is appealing. In the heart of the Lubéron region, backing onto a mountain with the same name, the region offers many walks, horse-rides, bike-rides, and car drives. Available daytrips are many and varied: Saint-Rémy de Provence, Avignon, Senanque Abbey, Mont Ventoux, Fontaine de Vaucluse and the striking villages of Gordes, Menerbes, Roussillon scattered within a 50 km radius. The property is surrounded by walls and hidden at the end of a cul-de-sac, close to the village. There is a stone shelter with modern facilities set back from the guesthouse. There is also a private garden, splendid swimming pool area with lawn garden. 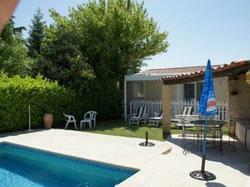 The swimming pool is shared with the landlords, but is most often available for the exclusive use of holidaymakers. -A fully refundable security deposit of 500 EUR will be required upon arrival for damages. -Please note that bed linen are not included in the room rate. Guests can rent them at the property per packet for 15 EUR per person and per stay. -Please note that bath towels are included in the price when you rent a linen package. -Please note that kitchen linen are not included in the room rate. Guest can bring their own. -Please note that the electricity fee is not included in the apartment rate between October and May and will be charged ? 0,15/kWh. This holiday home features a patio, barbecue and dishwasher.